On the evening of October 5, the large-scale classic Chinese dance drama Silk Road was staged in the Darling Harbor of the Sydney International Convention Center, the final stop of its Australian tour, after being performed in the Star Theater on the Gold Coast and the Newcastle Civic Theater. Silk Road is based on the world-famous Dunhuang frescoes and tells a moving story about a Dunhuang painter Magic-brush Zhang, his daughter and a Persian trader named Yunis along the Silk Road. About 50 outstanding dancers from the Gansu Provincial Song and Dance Theater gave excellent performances, impressing the Australian audiences with the charm of ancient Dunhuang civilization, as well as the elegance of Chinese dance drama and its implied oriental style. Since its debut in 1979, Silk Road has had a profound influence on Chinese dance and won stellar reviews, such as the “classic Chinese dance work of the twentieth century” and a “milestone in the history of Chinese dance drama”. During the past 39 years, the dance drama, staged more than 2,800 times in over 40 countries and regions and appreciated by 4 million spectators, has aroused huge response and spread the ancient Dunhuang civilization and Chinese culture to the world. 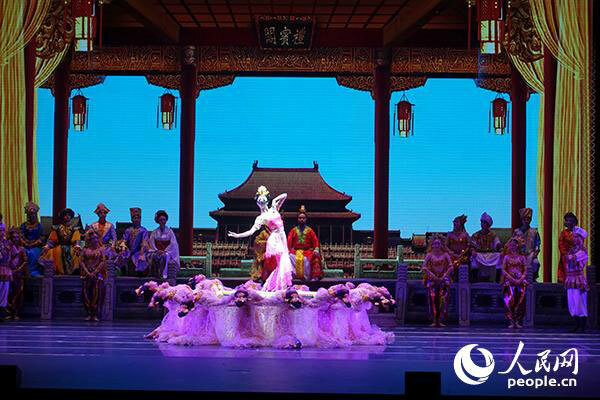 “Silk Road has been innovating on the basis of heritage,” said Lu Jinlong, head of the Gansu Provincial Song and Dance Theater and artistic director of the drama. Through modern stage design, gorgeous costumes, diverse tableaus and wonderful performances, the magnificence and splendor of Dunhuang art is fully displayed. “Dunhuang serves as a bridge connecting the East and the West, and different cultures converge here. I hope the Australian audiences can feel the beauty of Dunhuang and Mogao Grottoes through this drama,” Lu added. Hosted by China Arts and Entertainment Group (CAEG), the overseas tour of the dance drama Silk Road is the first project of “Dances in China” in 2018, a collection of dance performances launched by the CAEG to promote cultural exchange. The series covers not only classic dramas such as Silk Road, staged at home and abroad for decades, but also modern dance masterpieces with diverse styles. In the past four decades, the CAEG has introduced the Silk Road to audiences all over the world. : in 1981, the predecessor of the CAEG, the China Performing Arts Agency (CPAA) brought the drama to North Korea in a friendly visit; the drama was staged in seven European countries in 1982, Japan in 1984, and Northern Europe and the former Soviet Union in 1985. In 2008, a new version was launched at major cultural events of the Beijing Olympic Games, and in 2011 and 2013, promoted by the “Image China” brand of the CAEG, Silk Road was unveiled at the world-renowned John F. Kennedy Center for the Performing Arts and Lincoln Center for the Performing Arts to great acclaim. In May 2018, the dance drama was performed at the Beijing Tianqiao Performing Arts Center as part of the 18th “Meeting in Beijing” Art Festival to promote the cultural exchanges between the countries along the Belt and Road. On the occasion of the 40th anniversary of the reform and opening-up and the 5th anniversary of the Belt and Road Initiative, Silk Road’s debut in Australia has demonstrated the achievements of Chinese stage arts since the reform and opening-up, promoted the Silk Road spirit, and enhanced cultural and personal exchanges in countries along the Belt and Road.